There were boats at the Green Airways camp on Haggart but it seemed empty. My course kept me at a good distance for a reason. A canoeist has no right or reason to approach these camps. If people are there it is to get away from other people for a while. 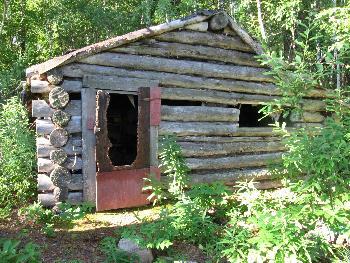 Further along I did spot an old cabin with the roof falling and the door eaten out by porcupines. In this case I did stop and look it over. In its day, which was not that long ago, it had served someone well. Looking at all the refinements that someone had spent many seasons working on made me wonder what had happened. With the equipment left behind it looked like the next trip just never happened and now time had taken its toll. It made me wonder when it will happen for the little log cabin I cherish in the deep woods of Northern Minnesota. My planned destination was Welken Lake, eight portages away. The byway is a nice one. It is very scenic with a lot of variety. The high water levels let me get over the entire route without any trouble. I think in drier times you would be walking your canoe through a lot of rocks and shallows. Eleven years of scraping rocks with my Wenonah Prism and just a small bump today wore a hole in the nose. Duct tape was applied but some water still seeped into the front air chamber. This evening some spruce gum .was squeezed into the hole and more duct tape applied. This will probably be a minor annoyance for the remainder of the trip. 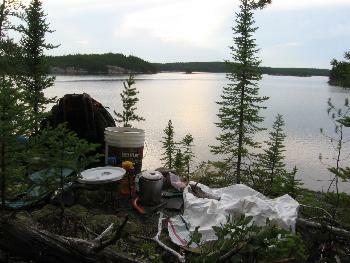 My campsite overlooks the main body of Welken Lake. Fire has burned the NE shore since my last time through here. Campsites are scarce here and this one has had light use. In the morning I headed up the east arm of Welken and entered a totally burned over area. Portaging through the 100 and 550-meter portages was very interesting. Plant life had started its rotation over again with some flowering plants dotting the landscape. The portage crew had been through and the route was easily seen through the burned timber. The fresh blazes on the blackened trees really stood out. 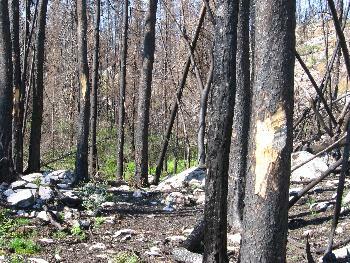 Black-backed Woodpeckers were flecking the bark off the crown fire killed trees in search of food. The trees burned black all the way to the ground were of no interest to them. Nighthawks were soaring low over the trees and the Juncos seemed to like the burned area too. 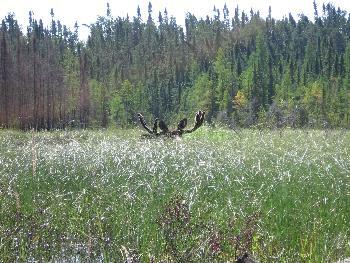 A bull moose was feeding in an island of green swamp in the blackened world near the 550-meter portage. 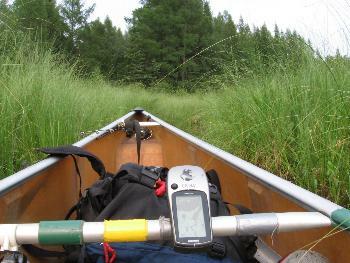 Burned or not, that portage is a challenging one. My spare single blade paddle serves as a walking stick when I carry the canoe through the portages but on this one I broke apart my two piece Carlyle heavy duty paddle to serve the purpose on the other carries. South of the 550 meter portage the good green timber returned. It was prettier but the starkness of the burned area has its own appeal. After a shore lunch of Northern on Aegean Lake a 70-pound backpack of food was left hanging between two trees. It will be picked up after a loop through the south-central part of the park is completed. 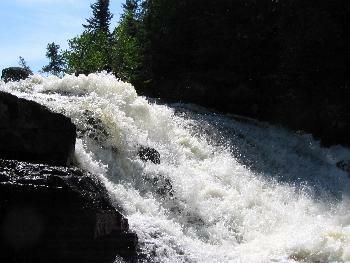 It will be a much lighter trip down the Bird River and back up the Talon. The area along South Aegean must have burned about 15 years ago and is all young Jack Pine. Camping sites were scarce and I finally pulled up to an open rock area in a little bay. Rotten trees were busted up to make a level tent pad alongside a rock wall. It turned out to be a great place to camp. A good canoe landing for canoes and an easy walk to a camp area 5 meters above the water. A great view up the lake was a real bonus. My Globalstar Satellite phone found a working satellite this morning on the first attempt. Their first generation satellites are failing because of solar radiation and service is going to deteriorate until their second-generation satellites are in operation. They are putting up eight first generation to help right now but the real fix will be in 2009 or 2010. A call was made home to update my wife on my location on the planned route. Her weather report of no rain in the coming days and the blue skies seemed to bode well for the days travel. The weather here can change fast and it soon did. A thunderstorm cell moved over me on a short portage. The canoe was propped in a tree to provide an impromptu shelter. My mug of tea was still hot and my infamous bucket served as a fine perch as the lightning, wind and hail passed by. Raindrops were still dripping from the trees when the sun came out and travel continued. The water level on the Bird River was about 2 feet below the high-water mark on the rocks. The water was just high enough to slide my canoe over the logs and rocks in the stream. I wondered if a major beaver dam had failed to allow this drained river look in an otherwise high water year in WCPP. 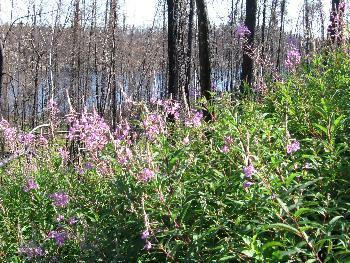 The landscape was all young Jack Pine until some pockets of old growth timber appeared near Eagle Lake on the southern boundary of the park. Some of the rapids could be pulled through and one unmapped chute north of the last 50-meter portage before Eagle could have been run but I could not see around the corner so I took the portage. A Spruce Grouse and a Yellow-rumped Warbler made one of the portages a little brighter.